Big thanks to Roo for orchestrating and sending over the final version of this interview. Guitarsnake has kindly offered to answer questions from a variety of different fans, including us! 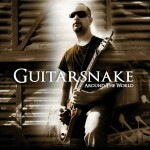 You try to make a living on guitar music, you took an outstanding name “Guitarsnake”, did you also check the market for what people like to hear and write accordingly to make a sell or did you try to make a sound yours in the hope consumers would like it? Nicolas: Today it is quite hard to set apart in instrumental rock domain. There are a lot of great guitarists! Unfortunately, lots of them do the same kind of stuff. I don’t play music to show people what I am capable of….I am just playing and not demonstrating. I often take a new look at my work and every time I am composing I try to stand back. Why did you choose to play Mayones Guitar? Nicolas: That is simple ! They are the best guitars in the world ! I had lots of different brands in my hand since I started the guitar but the Mayones ones are extraordinary. This company produce matchless quality instruments! All people who have tried models I am playing one bought one! Are you using social media sites to promote your CD? Nicolas: Yes I use the most famous websites such as Facebook, Twitter or Myspace beside my official website. It is very useful to keep in touch with people/to give my musical news to my fans. Unfortunately it takes lots of times to make my own promotion and time is hard to find when you have to do everything by yourself. Why do you think certain music fans prefer instrumental music over traditional vocal oriented music? Nicolas: It’s just different taste, different musical culture maybe?! There are many bands I like, but sometimes I am not a huge fan of the voice of the singer. Even if nowadays these two kinds of music can reach high technique levels, instrumental music will mainly attract people who are already musicians/already playing music (themselves). The fans like to identify themselves to this music with the sound and the technique it contains. You learnt to play the cornet and trumpet from a very early age, do you think this made it easier to develop skills on guitar? Would you recommend people learn other instruments alongside guitar? Nicolas: Personally trumpet had no influence on my guitar playing. You know I started the trumpet at the age of 6 and when my brother brought his first electric guitar, trumpet didn’t exist anymore for me. I will always remember what my trumpet teacher told me at the end: “Well! You would not be starting to play the guitar? You are wearing a nice shirt of JS!” Then, with the time I learnt to appreciate the trumpet with John Williams, Erik Truffaz or Miles Davis. Knowing how to play another instrument beside the guitar at this step of my life does influence on my composing. How do you build your instrumental development in your daily practice? Nicolas: I don’t compose everyday. When I am playing and I have a « riff » that comes back often, I know it is a basis of a work I have to go deeper in. It has to be natural. This is my way to compose. If I am forcing myself, it just will not work, I need time to compose. 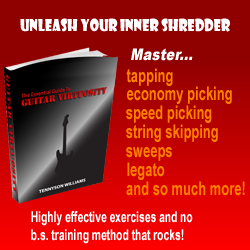 You have been invited to play recently on the album “Guitar Addiction a Tribute To Modern Guitar”, can you tell a bit about this experience and how you enjoyed it? Nicolas: I have been invited to be a part of that fantastic project a few days after the release of my second album. When I saw the list of the other invited musicians, I was first really scared and then I just felt honored to be a part of this. Franck (Ribiere) sent me a part of the title I was supposed to play. The other parts played by the other guitarists were not recorded yet. I had to stay quite conservative on my part, I could not do a solo that would not have consistency with the rest of the music. Franck is really open-minded, talented and is dedicated in what he is doing. This is rare.